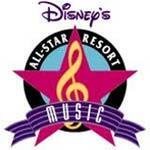 Disney's All Star Music Resort is a Disney Value Resort hotel featuring giant icons that pay homage to classic music genres including Broadway show tunes, calypso, country, jazz and rock n' roll. Guest rooms are divided into 5 pairs of 3 story buildings each bright, whimsical pair is themed after one of the featured music genres and decorated with massive musical instruments. For larger families, Disney's All-Star Music Resort is the only Disney Value Resort to offer family suites, which sleep up to 6 Guests each.